We created BrainBoost in 2006 as a place for kids to learn from incredible teachers, in ways that would really make a difference in their lives. We had a lifetime of working with kids – as coaches, tutors, mentors, and camp counsellors – and we could see that across society, kids were failing to learn what they needed to learn for a rich and meaningful life. At best, they were getting through; at worst, school was a nightmare. From our personal teaching we knew that great things could be accomplished when teachers and kids worked around goals relevant to the student, in a way that was inspiring, honest, and in line with a student’s strengths and weaknesses. However, as individuals we could only teach so much. We became obsessed with creating a space for many educators and students to work together, in a network of awesomeness, that would allow kids to become the people they wanted to be, and the people society needs. By 2006, we were ready to rock. We started in a church basement, with 4 employees and 35 students. Today, our team of 50 serves over 300 students, with nearly 60 of those students coming full-time. We are blessed and grateful to have realized our dream. Every day we work collaboratively with students and teachers, to grow minds and support our students in living a meaningful and competent life. We consider ourselves lucky to be surrounded by such special people, staff and students alike. BrainBoost approaches learning in a way that’s student centred, pragmatic, and depends on a highly skilled staff. BrainBoost builds each student program around an agenda, or goal, that we construct with the student. We only accept students who want to attend (no, your mom can’t just sign you up! ), and we take frequent feedback from students and parents to ensure we’re meeting students’ expectations and goals. Our expertise in educational design ensures that each program allows the student to realize their aspirations, with an outcome that is truly student driven. With such a variety of student goals, we can’t just buy into one approach to learning. What works varies greatly, depending on the situation. We use tools from many education disciplines in our work: special education, clinical psychology, sociology, biology, philosophy, social justice, design, and more. Because our institution has so much knowledge in such a wide variety of areas, we can use these knowledges as a tool, not an ideology. Every student has a case manager to make sure the program is amazing! Case managers work with parents, students, BrainBoost coaches and tutors, and other professionals to design a holistic and impacting plan, and adapt it in light of challenges and new goals. Our team is a community of practitioners. They work in a network that supports their practice, challenges them to improve, and nurtures their skills. We’ll help with homework and other concrete tasks while building deep conceptual understanding, so that the learning lasts. We start all our programs from what the student wants to accomplish. We work with the student to create a plan that integrates their strengths, challenges and goals into a concrete strategy for their learning. We are experts in personalizing learning for students with a variety of learning profiles (including learning disabilities, giftedness, autism, and social/emotional challenges). 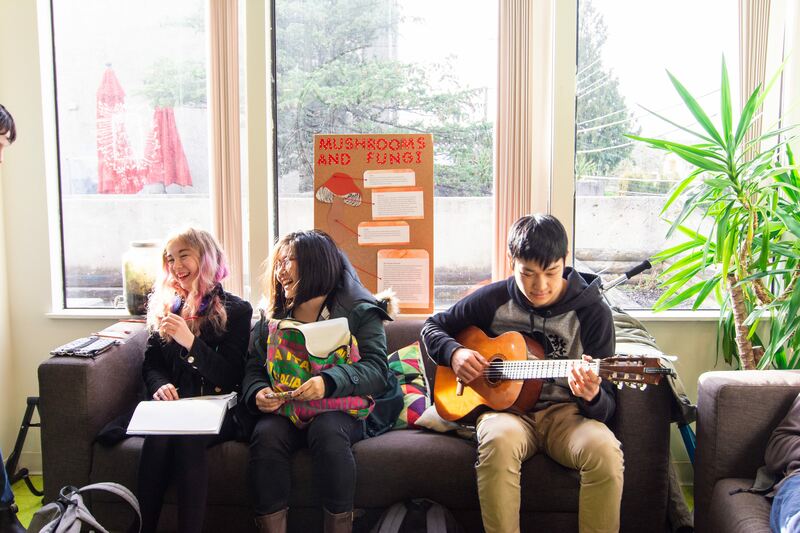 Our space, “The HUB”, is one of productivity and vibrancy but also a place where students feel safe and comfortable. In addition to the many educational professionals on staff, we have programming teachers who program, writing teachers who write, and science teachers who use science to improve their daily lives. We provide dynamic daily support, regular meetings and ongoing training seminars to ensure our staff are always growing and learning. This means your program never stops evolving and growing. We’re obsessed with improving what is not working, and building on what is. In addition, we take ideas from everywhere, rather than using one educational model. As a result, our services are constantly evolving and growing. We choose the very best from the hundreds of applications we receive, and ensure quality teaching with repeated interviews, auditions with our students, and a gradual start for each employee.